A Cornish charity has been awarded £85,300 to run pub quizzes aimed at helping change people's attitudes towards climate change. 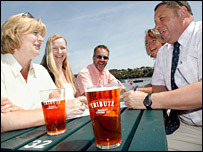 Camborne-based Community Energy Plus will run pub quizzes and talks across the county over the next two years. The aim is to attract people who may not normally think about the impact of climate change. The project is funded by the Department for the Environment, Food and Rural Affairs (Defra). The Climate Change...So What? quizzes will be held at St Austell Brewery pubs, which are helping market the project, and will be followed by a discussion about climate change. Across England a total of 53 similar projects will receive funding from Defra's Climate Challenge Fund totalling £4.6m over the next two years. Jasmine Reilly, of Community Energy Plus, said the cash would be spent on setting up and organising the 20 quizzes. The group would also go out to rural communities without a pub in village halls, schools, pre-dinner entertainment and Rotary events. Finally there will be a Question Time-type Great Cornwall Climate Change Debate with major speakers. She said: "We have to put together a programme of where we are going and how to do it. "We have to advertise it and that's never free, as well as travel." Launching the initiative, Environment Secretary David Miliband, said it was important to develop "new and innovative ways" of tackling climate change. He said: "Climate change affects all of us and I believe that today's successful projects will reach new audiences and communities at national, regional and local level and shift people's opinions in favour of action to tackle climate change. "Government is playing its part and giving the lead in tackling climate change. "But we will not succeed without the support and active participation of all sectors of society."